Around 2 years ago, I was honoured to be invited by geologist and long-time educator Tom Farmer to collaborate on a textbook that expounded on the principles of climate science as well as put climate change denial in perspective. 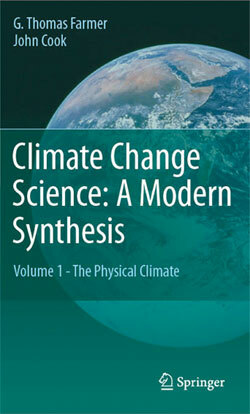 That collaboration has now been published by Springer; the textbook is Climate Change Science: A Modern Synthesis (volume one of a two volume set). The textbook is written for the introductory science student at the undergraduate college level. We describe the discipline of climate change science, and individual climate scientists whose expertise spans Earth history, geology, geography, biology, oceanography, astronomy, mathematics, physics, chemistry, engineering and more. We've attempted to cover a variety of the empirical evidence for and the effects of Earth's changing climate. Significantly (and unique in climate textbooks to my knowledge), there is a detailed analysis of the phenomenon of climate change denial. Students learning climate science will need to put into proper context the myths and attacks on science conducted by those who deny the scientific consensus. One chapter is "Understanding Climate Change Denial", examining the social, psychological and rhetorical aspects of climate change denial. Another is "Rebuttals to Climate Myths" that debunks many of the most common climate myths (and yes, I made sure we adhered to the principles of the Debunking Handbook). The book is available in hardcover and in e-book form (PDF format). You can also pre-order the hardcover from Amazon. You can find out more details including the full Table of Contents at the Springer website. Tom Farmer has over 20 years of experience teaching environmental sciences at the undergraduate level, at the University of Virginia, University of Cincinnati, Northern Kentucky University and Howard University. He wrote the initial curriculum and taught Geology at James Madison University and served as Associate Editor for The Professional Geologist. He has published 3 books: Earth Materials and Earth Processes, The Groundwater Monitoring System and Hydrogeology at Love Canal and Peat Bogs and Hydrology in the Lake Superior Region. John Cook is the creator of Skeptical Science, winner of the Australian Museum 2011 Eureka Prize for the Advancement of Climate Change Knowledge. He is currently a research fellow in climate communication at the Global Change Institute, University of Queensland. He co-authored the book Climate Change Denial: Heads in the Sand with Haydn Washington and the online booklet The Debunking Handbook with Stephan Lewandowsky. I am a long-time reader of this site and find it invaluable for solid, scientifically valid, information. Thank-you. I do have a question regarding the textbook described above. In general, this site (correctly) places a great deal of importance on the peer-review process for papers presented in the technical literature. Could you please explain what kind of review a textbook such as this receives before publication? Response: [JC] My experience with the publishing of this textbook matches that described by CBDunkerson. Springer reviewed the textbook and provided very detailed feedback on required changes to the content. My impression is that it is detailed although not as rigorous as peer-review where a paper is focused on a single topic and reviewers would be experts on that topic. In this case, the textbook is multi-disciplinary and such focus on a single area is not practical. Congratulations on the fruits of what must have been a great deal of effort! Hopefully SkS visitors will send a link to this article to instructors/professors of climate-related classes whom they may know (I'm doing so now). It's unfortunate that introductory-level textbooks like this are too pricey for a more general audience, because we desperately need more widespread knowledge about climate science in order to make progress on actually mitigating climate change and leaving the next generation a tolerable planet. Thanks for this good work! danp, I can't speak for this book, but I know from personal experience that the degree of review for textbooks is usually entirely up to the publisher. When I worked for Simon & Schuster many years ago most textbooks would go out to just two or three 'content reviewers' while more than a dozen people poured over layout, spelling, grammar, presentation, et cetera. Basically, if there weren't any obvious errors the content would be approved. Other publishers might not check accuracy at all. Springer is a large and fairly well known publisher, and thus I suspect that maintaining their reputation is an important part of the business model. Thus, some sort of content review seems likely, but I doubt it would be as detail oriented as scientific peer review. Of course, textbooks also tend to cover 'settled' issues rather than cutting edge new research. This just lends credence to my theory that there are several John Cooks working in closely-spaced iterations of the multiverse, with leakage. I looked up the Table of Contents on Amazon and it looks wonderfully thorough and enlightening. Well Done. My only concern has to be the price. With several climate books on my shelves, shelling out 89 to 90 euros is quite steep, especially as SkS is readily available! Any chance of a paperback edition? Is the target audience the academic community? It does not seem the type of book that will attract your ordinary "popular science" reader. Is there a Cliff Notes version? I say that in jest, but there is a need for a very short version of the same thing. Sort of a pocket climate science, for the general public. My friend the Professor is interested in the book for a possible forthcoming course on climate science, but even for students the price is a barrier because her students are not wealthy (this is a factor with other textbooks too). I imagine Springer has done the research and the math, but I wonder if they ever consider the "Henry Ford approach", namely sell them cheap enough that lots of people will buy them. I intend to recommend it for my local library. My experience in the past has been that they almost always buy books I recommend - though this one may prove a little pricey. The advantage of doing this is that as well as getting to read it you make it available for other readers. As far as content review is concerned it is worth noting that Salby has published a textbook which includes his theory that the increase of CO2 in the atmosphere is not driven by human emissions. So far he has been unable to publish it in a peer reviewed journal. Of course this is a very small part of a text book that is presumably otherwise accurate. What does the second volume cover? I can persuade my institution's library to buy vols 1 & 2, but only if the second volume has coverage of the health impacts of global warming. Congrats, John Cook! You'd be the 2nd person I know who has his name on the cover of a Springer book. Did someone from Springer ask you to write this? It looks like it handles the subject very broadly 'Pliny the Elder', 'History of Science'??? There are definitely chapters in there I'd need to read in order not to make a fool out of myself in scientific discussions. I've no influence on what the local university does in it's library, though I've got a couple of friends who might have. Unfortunately one is a mathematician, and the others ecologists. One of them might have good contacts to physics dept, though. I believe the Enviro intro classes still go by the classic 'Understanding the Forecast' by David Archer, but I'd have to ask about that. I used the "Look Inside" feature at Amazon to scan the Table of Contents; the first name of Barack Obama is misspelled as Barak Obama (22.6.4 section header). In answer to comment #12 by calyptorhynchus, the second volume will be a tour through climates of the past and how our current global climate compares with past climates. There will also be coverage of health impacts on both animals and plants throughout Earth history. Volume 2 is in the planning stage and any and all suggestions are welcome. To comment #14 by jimvj, sorry about misspelling our great president's name. It's something neither the authors nor editors caught. The second edition will correct the spelling. "There will also be coverage of health impacts on both animals and plants throughout Earth history." Often people mention warming trends in the past without the context of mentioning what the flora and fauna of the time were or how those past condition are relevant to the needs of humans today; especially 7 billion humans. I’ve been lurking here at SKS for the past 4 years. During that time I’ve never posted. I know the protocol that’s employed concerning off topic statements. You always tell the poster that they should post in the appropriate thread where it can be addressed. Well I finally decided to post so I went to http://www.skepticalscience.com/water-vapor-stratosphere-global-warming.htm to try and figure out what kind of point a denier was trying to make. I’ve read several of your articles on water vapor but all my knowledge is general and his was more technical than I’m use to in a discussion in which I’m involved. Excuse me for posting on a thread that has no relevance to what your discussing but as far as I can tell my post was never noticed or it wasn’t worth commenting on. Stranger @17, I have made some general comments on the issue. Very general, I am afraid, as I am unable to determine the actual point of your respondents argument, and hence respond directly to the claims. I am half way through the text, including the last two chapters on climate denial. Though I have found distracting little errors and duplications, I want to know if this text is yet being used in an accredited university. If not, I am willing to provide financial help to the students of the professor that first uses it. I have tried to get information from our publisher on specific adoptions but have not yet succeeded. Springer says they can provide me with statistics from each region (state?) but not individual institutions. I find this difficult to believe. I will forward a copy of your kind offer and approach them in a different way in hopes of receiving the pertinent information. If you have a list of the "distracting little errors and duplications" I would appreciate receiving it at rockytom09@gmail.com. We are in the process of preparing for a 2nd edition for sometime in the near future, as soon as John and I complete Volume 2, "Earth's Climate History" and John finishes his MOOC and Ph.D. It is my sad duty to inform you that RockyTom AKA Tom Farmer has passed away after a long illness. It is my understanding that Volume 2 was about complete and I hope that Springer will allow the book to be published.